CAREER: "Patsy" Haynes was one of the early members of Casablanca in the 1940s and gained lasting recognition with his virtuoso performance of "Bells of St. Mary's" in 1948. He was one of eleven panmen selected to join TASPO as the Trinidad & Tobago representatives at the 1951 Music Festival in England. 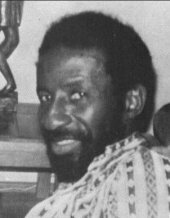 He competed in the solo competition during the first Steelband Music Festival in 1952 and finished 3rd behind Dudley Smith (1st) and Neville Jules (2nd). He migrated to the USA in 1958 where he spent more than 20 years with the Harlem All Stars steelband in New York. An improvisor and a jazz player, Haynes performed at the Newport Jazz Festival in Rhode Island, USA, and on the soundtrack of the movie, "Arthur."